TOPCOAT® MASTER-CRAFTSMAN F11 POLISH & SEALER – 1G/3.79L (REFILL) – WEB SPECIAL. TopCoat® Formula 11 is a Master-Craft Professional Sealer formulated to enhance, protect, & maintain any material or surface. F11represents the next generation of TopCoat®’s water-based, Eco safe, highly Advanced Multi-Purpose & Multi-Use coating technology, complimenting our Professional line of TopCoat® sealers & products. F11 Improves coating characteristics & performance vs. TopCoat® HPS, especially on dark colors, hides micro-scratches & swirl marks more effective, longer lasting, more durable, extremely hydrophobic (easier to use on glass), insane depth of image & shine, wickedly slick with improved easy-release and non-stick coating technology, designed to significantly reduce weathering, dirt & debris build-up on any surface, ECO Safe! Because TopCoat® is silicone free, surfaces are not left artificially or dangerously slick. Water-based formula, Eco Safe! No solvents or abrasive compounds. Easy Release Characteristics with Non-Stick Formulation. No need to stir or shake. Polished surfaces are extremely hydrophobic (water-resistant) / ideal water repellent on all glass windows/windshields! No orbital or mechanical buffing required. Protect and reduce harmful effects from bird droppings, bug splatter, acid rain, brake dust, etc. Multi-purpose sealer coats, restores, & protects multiple surfaces & materials, even plastic! 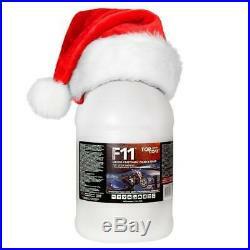 F11 can withstand high temperatures and isnt flammable making it great for engines, glass stove tops, grills, etc. Save time: Easy one-step hand application polishes in less than half the time it takes to wax! Coated surfaces are easier to maintain, remains cleaner longer! Multi-surface application eliminates the need for other costly products. Clear formula: No unsightly white wax residue left behind! F11 maximizes depth of color & shine with minimal effort. Covers up light surface abrasions such as spider-web scratches/swirls. Superior results on dark colors! F11 is extremely slick, with its enhanced easy release characteristics! Multi-layer applications enhance product performance from protection to shine! The ultimate wax replacement sealer for your auto, bike, RV, plane, and more! DIRECTIONS: For best results, apply to a clean cool surface, out of the sun, at ambient temperature. Spray F11 onto the surface you want to enhance, coat, & protect. Spread F11, while hand buffing F11, into the surface using a clean micro-fiber towel, flipping to a dry portion of the micro-fiber towel often during buffing. Final buff the freshly applied F11 with another clean & dry micro-fiber towel to ensure F11 is entirely polished into the surface, leaving a streak free, incredibly slick, and amazing shine. Coat one area or section at a time, move to the next, and repeat the process. DIRECTIONS For a professional level application: Apply F11. To a clean cool surface, out of the sun, at ambient temperature. Heavily onto the entire surface of the vehicle, motorcycle, boat, truck, RV, etc. Let it sit for 10-20 minutes. Then, using a clean microfiber towel, rub all areas where F11. Final buff the freshly applied F11. With another clean & dry microfiber towel to ensure F11. Is entirely polished into the surface, leaving a streak free, incredibly slick, and amazing shine. NOTE: You will use more F11. On the initial coat. The more you use the less you use moving forward. 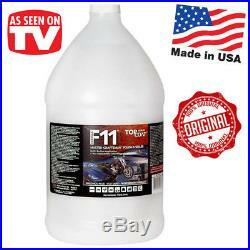 F11s Easy Release & Non-Stick formula provides easy cleaning & easy maintenance once sealed with F11. 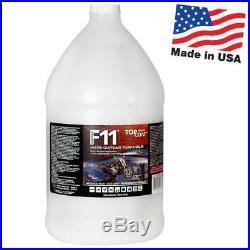 Eliminate washing entirely by applying multiple coats of F11! Use F11 to enhance & restore painted surfaces, gloss or denim (matte), fiberglass, metal, chrome, glass, plastics, acrylic, rubber, vinyl, leather, & more. F11 provides incredible water shedding, beading, and repellency on glass, windscreens, & windshields A must for ultimate visibility & driving safety. The item “TOPCOAT F11 POLISH & SEALER 1G/3.79L (REFILL) MOTORCYCLE STOVE GRILLS WINDSHIELD” is in sale since Thursday, November 23, 2017. This item is in the category “eBay Motors\Parts & Accessories\Boat Parts\Accessories & Gear\Paint & Maintenance”. The seller is “treedeal” and is located in usa. This item can be shipped to United States.